Godly Play is the foundation of our Sunday morning educational ministry at Epiphany, providing classes for Pre K - Fifth Grade. This curriculum allows our youngest learners to build upon a solid understanding of the Biblical stories in both the Old and New Testaments through storytelling and "hands on play" related to each story. 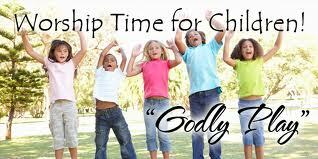 Godly Play Sunday School opens the mind of our children so each child can learn in new and creative ways. To learn more about Godly Play, please click here to visit their website. Our Middle School youth learn how to Live BIG in Sunday School with lessons of relating faith and scripture to their lives as tweens and teens. Also, we provide Confirmation instruction during the middle school years with our FaithLife classes on a bi-monthly schedule during the school year. FaithLife is a three year cycle which teaches Christian doctrine and scripture from a Lutheran perspective. Our Sr. Highs meet weekly for learning and fellowship with a teaching format that helps our teenagers consider current issues in relationship to faith on a daily basis.